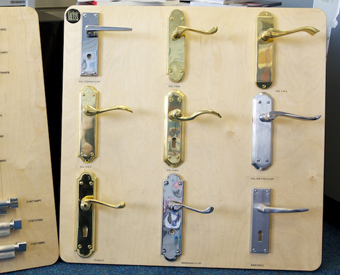 We provide a range of ironmongery services. As locksmiths we feel this gives us an advantage over your general ironmongers as we understand how to make style and security work together. The right door furniture can be the finishing touches in your commercial or domestic property, we can work from architectural drawings or we can conduct a free survey so we can meet your every need. From survey to installation we will follow each project straight through small or large. Why not pop in to our store and take a look at our display boards and our blister packed stand from Carlisle Brass products.